Anna Douglas, PhD is one of the founding teachers of Spirit Rock Meditation Center and serves on the Spirit Rock Teachers Council. She has taught classes and retreats in the Insight Meditation tradition nationwide for 30 years. She has a background in psychology and the arts, and offers ongoing psycho-spiritual mentoring for students. She divides her time between the San Francisco Bay Area and the Sonoran desert of Arizona. 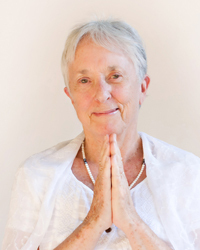 She is the guiding teacher for Insight Meditation Tucson. For Anna's Facebook Page - Anna Douglas, PhD, click here. For audio recordings of Anna's talks, visit DharmaSeed.org.